To every great story comes a final chapter. Here’s ours. Over the course of life, you’ve likely had dozens of offers, opportunities and miscellaneous thingamajigs reach out to you and say, “take me.” Things big, small and everywhere in between — from the Popeye Pez dispenser you spied on your way home from school to the vintage sports car that glided by as you stood dumbstruck on the sidewalk. Those passing fancies now reside in one of three categories: one, you splurged on the Pez dispenser; two, you outgrew your infatuation with the ’64 Austin Healey MKIII; and three (and this is the painful one), your jaw still drops when that British racing green’64 Austin Healey rounds the corner. The infatuation persists. Martis Camp just announced the release of its final phase — The Lodge Estates. Its attributes are impressive, with many of the 42 homesites framed by sweeping views of the Pacific Crest and the stately Camp Lodge, qualities that place it in the same rare air as that elegant sports car that lingers on your mind. Unlike that car, however, these homesites possess a definitive sense of finality. Hence, our “final” release. Our point? If your feelings for Martis Camp are similar to those of Forbes (who define it as “Possibly the best four season community in the U.S.”), then procrastination is not your friend. Consider the fact that over 65 properties (to date) have sold this year alone and that Martis Camp also just rewarded its members with an acre of lakefront Tahoe property, and the conclusion comes easy: this opportunity, unlike a Popeye Pez dispenser, won’t be long for the taking. Time waits for no one. That’s just how it is with the best things in life. 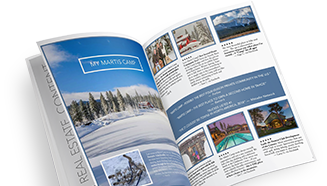 next post: Sales are soaring at Martis Camp. Apparently, kids are as well.